Christine: Roger Price, the producer of the show, came to my junior high school [in 1978]. There was an announcement over the PA system saying that kids who wanted to try out for a TV show should go to the English class after school. 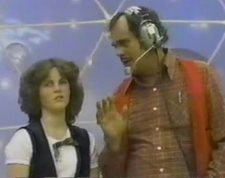 My friend Susan, who was more interested than me, brought me along to be in her skit, and Roger asked me along with five other kids from my school to come to formal, on camera auditions at CJOH (the local TV station). My only prior experience was that I was usually the class clown. I had also written a humorous column for the school newspaper called "Dear Blabby", my creative expression being more along the lines of writing, not acting. I learned later that Roger chose me to come to the auditions because I was small for my age, had clear skin, and good teeth: kind of like picking horses. I think he also favored kids who were articulate and maybe a little bit precocious. 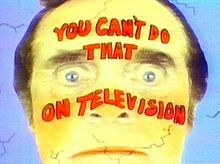 You Can't Do That On Television (YCDTOTV) was a local, live show for the first couple of years and I had no idea it would be popular outside Canada, ever. You need to understand: there were no channels above channel 13 back then. Cable was this new thing that no one thought would last. 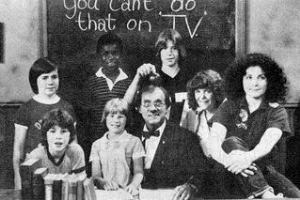 You Can't Do That On Television started in 1979 as a local kids sketch program in Ottawa, Canada. It wasn't until it was picked up and broadcast on the cable channel Nickelodeon in the U.S. beginning in 1982 that it became the popular show that many of us so fondly remember. YCDTOTV was certainly one of my favorite television programs for a couple years in the early-mid-80s. The show ran a total of 10 seasons and 143 episodes until 1990, but its peak of popularity was really from 1983-1986. The ratings gradually declined in Canada (by 1985, it was seen only once a week in a Saturday-morning time slot on CTV), but YCDTOTV continued to go strong in the U.S. on Nickelodeon, where it eventually aired every day. Q: How did you get the nickname "Moose"? I think I know this answer, but does anybody still call you "Moose" or are you pretty much just Christine now? Christine: A school mate named Danny Burns started calling me "Moose" when I was nine, because I was so short. I'm a 50-year-old grown woman now. No one calls me "Moose" anymore. Q: What can you tell us about Roger Price as the creative force behind YCDTOTV? 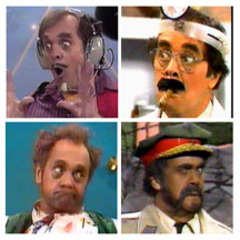 How involved was he in each show and as mentors to you kids? Christine: Roger was totally involved with every show, it was very much his show although each show was "workshopped" in the sense that we had numerous read-throughs in which we would rewrite and change scripts. It was in that sense very much a collaborative effort and Roger was very keen on it being made by kids, for kids, from a kids' perspective. So he created this atmosphere in which we were encouraged to really improvise. I would say someone like Les Lye was more of a mentor; Roger was really just a big kid. Q: I am always amazed by what Les Lye did on the show. What can you tell us about the late Lye and your experiences working with him? You said he was a bit of a mentor, but was he a father figure at all on set? Christine: Les had his own kids at home and was not a father figure on set. He was a colleague, always treating the kids like partners, collaborators, and fellow actors, never as children. He was hilarious, and incredibly talented. We had fun. There were only two adult actors on the show. Abby Hagyard often played the Mom and any other female characters. Les Lye played countless characters including Ross the stage director, Barth ("I heard that! "), Blip the arcade owner, Snake Eyes the bus driver, El Capitano of the Firing Squad, the dungeon master, Lance Prevert the father, the doctor, the teacher, the principal, the coach and any other male adult character in almost every skit. The versatile and hilarious Lye appeared in every episode of YCDTOTV and since passed away in 2009 at the age of 84. Q: How difficult was it for you and the rest of the cast to be creating the show with what I am sure was long hours of work while still being in school and having those responsibilities? Did it consume all of your time or were you still able to do some of the things that kids and teenagers normally do? Christine: The hours were long but it was really what we all wanted to be doing. We would usually take the bus from school out to CJOH every day for drama lessons in the beginning of the week, then for read-throughs on Wednesdays and Thursdays, then shooting all weekend including Friday after school. I was in every show so it was fairly intense for me, but it also gave me great opportunities to travel. I traveled all over the U.S., got to go to New York City fairly often, and while I remember never sleeping in after the age of 14, I also remember still having lots of fun with fellow cast members, with my friends, and making it through high school with pretty good marks. I didn't end up going to University right away but as soon as I stopped doing the show I did go to Art College and got a fine art degree. Q: You were often seen more on the main set and locker jokes segments. Is there a reason why you were not in the sketches as much as some of the others? Christine: I think the reason was because I was the host, so I ended up in the main set or in skits with Ross more than the others. I think it's also because I was older than the other kids so it started to seem odd for me to be playing a kid, for example, in the classroom or living room. 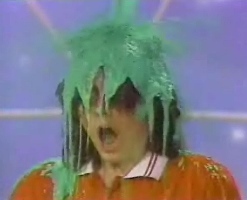 Q: You did get your fair share of green slime and water dumped on your head. Was that enjoyable at all or something you preferred to avoid as much as possible? Christine: I didn't really mind getting slimed or having water dumped on me: it was always at the end of the day so I could clean up afterwards, and we got paid $50 extra for a sliming and $25 extra for water. I can't believe they were paid extra to get slimed or watered! The green slime became an iconic element of the show and of Nickelodeon (becoming very prominent on Double Dare and still used to this day). Q: Was the cast very close during filming? Who were you closest to on the show? Do you or did you keep in touch with any of the cast members after? Christine: We were close. I saw a lot of different kids go through the cast and, in the later years, the difference in age between me and the other cast members meant that we were too far apart in age to really hang out. But in the early years, I hung out a fair bit with Lisa Ruddy, Kevin Kubusheskie, Kevin Somers, and Jonathan Gebert. I still see Carol Hay, our drama coach, every now and again and reconnected with Abby Hagyard (Mom!) recently. Q: What can you tell us about a couple of the other longer-term memorable cast members, Lisa "Motormouth" Ruddy and Alasdair Gillis? Christine: I just saw Alasdair for the first time in a long time in New York last fall. It was great to see him, meet his wife, and hang out in NYC with them and Carol Hay. He is doing really well, he works in social services and he's a very centered, smart guy. I haven't seen Lisa in a very long time. I lost touch with a lot of people when we all scattered and I moved to Toronto. Q: Any interesting stories about making YCDTOTV that you can share with us? What are some of your best memories from making the show? Christine: My best behind-the-scenes memories are of the friendships I had with Les Lye, Abby Hagyard, Carole Hay (our drama teacher), and other cast members. Many of these friendships are enduring and that's really great. Q: Did you enjoy the increased attention and popularity as the show became one of the most popular kids programs not only in Canada but in the U.S. as well? Do you still get recognized often in public? Christine: I didn't enjoy the attention at all. I am an introvert by nature and while many actors are in fact introverts, I'm not an actor! The attention many of the kids got when we first started out was pretty negative attention: there was some bullying by other kids at school, etc. The most positive attention we got was in the U.S. I sometimes get recognized by people, not so much on the street but in my work, because I still work in the media and the show has had a bit of a resurgence in visibility because of YouTube. Q: You left the show in 1986. What made you feel it was time to move on at that point? Christine: I was 23, much too old to be playing a kid! It was time. I had also moved away from Ottawa so I wasn't able to really be involved with drama classes and the other activities that make you part of an ensemble. We were also producing another show for Nickelodeon in Toronto called Turkey Television which didn't really "fly" (excuse the poultry pun) but which eased the transition. 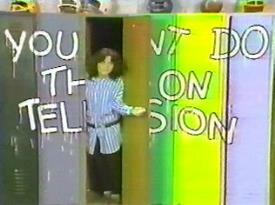 Q: Have your own children ever watched much of YCDTOTV? And if so, what do they think of the show and their Mom's performance? Christine: My kids have probably checked it out on YouTube. I'm not sure what they think, I am afraid to ask. Christine: I have stayed in the media. I went to art school then started working as a TV director, then as a producer. In 2003, I did a little reschooling and switched into Digital Media where I work today, producing digital content like websites, games, content marketing campaigns. I was the Director of Interactive for eight years at TVO, our educational public TV station here in Ontario and I'm very proud of those years, as well as the times I have spent teaching college here in Toronto. I started my own business last summer. My interactive agency is called Analytical Engine Interactive. We are a usability and content strategy consultancy and so far I'm pretty proud of that as well. Q: What else has Christine McGlade been up to more recently? Any acting or on-camera work? What can we expect in the future? Christine: No acting per se. I did a voice gig on a really fun podcast called the Hadron Gospel Hour, but that was just a for-fun thing. [Christine was a special guest on Episode 13 from October 2014] This spring I plan on creating a series of online courses on Content Marketing, watch for those! 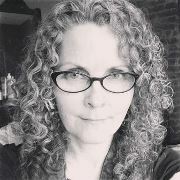 I am so pleased that Christine was able to take some time to answer some questions so I could share them with you here. If you'd like, you can keep up with her on her blog at ChristineMcGlade.com and follow her on Twitter at @cmcglade. 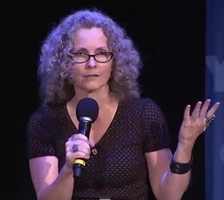 I want to take this occasion to again thank Christine McGlade for her contributions to '80s pop culture through You Can't Do That On Television and, even more, for going back to the '80s with us here for a little while as well.